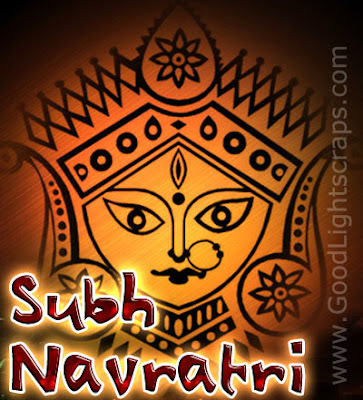 Navratri is celebrated twice in a year.One after the festival of Holi in the month of Chaitra Shukla Paksha from Ekam (First day) to Navmi (Ninth day). 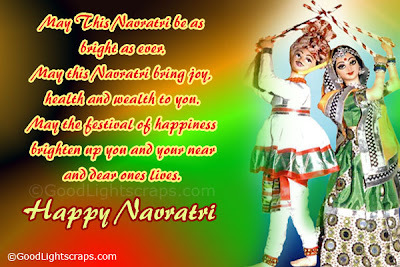 These are called Vasanth Navratri. 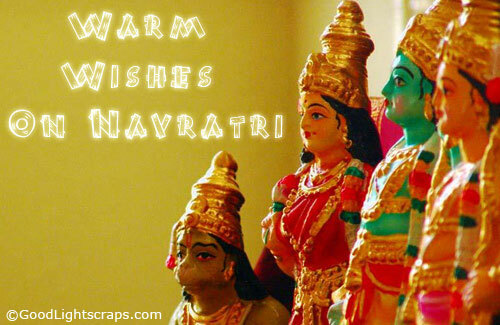 In this, prayers are offered to Lord Vishnu. 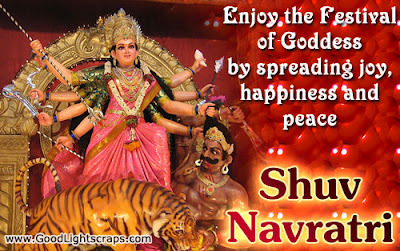 Once before Dussehra in the month of Ashwin Shukla Paksha on Ekam (first Day) to Navmi (9th day). These are called Sharadeeya Navratri. 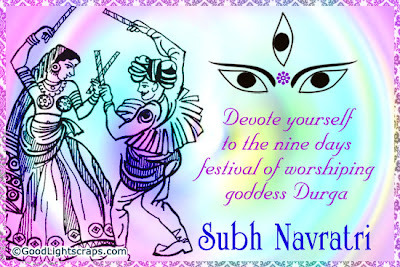 In these nine days of Navratri, we pray to Durga Maa. 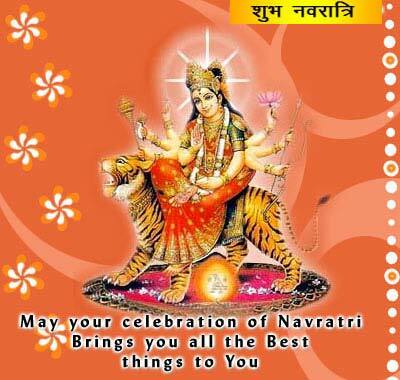 On the eight day of this Navratri, Durga Maa was born, hence her puja on this day is of special significance. These nine days also have a special significance for unmarried girls. - Roli, moli, chawal, paan, betl nut. Jhuwara is grown - On the first day of Navratri, take a large earthen pot with a wide mouth, put some sand in it and plant either jaun or wheat kernels which have been soaked the previous night. Every day a little water is sprinkled over them and they are put in sunlight for a short time for germination. Place the kalash by putting wheat grains on the pata, fill water in the kalash, place live mango tree leaves in the mouth of the kalash and put a coconut in the middle, Moli is tied on the neck ofthe kalash. Place Durga Maa’s image on the pata and worship with roli, rice, flowers, belpatr, sindoor, abhir and gulal. Take a small clay pot, add a burning coal to the pot, pour ghee over the coal and offer a small piece of laddoo, peda or halwa. Keep adding ghee at intervals. The higher the flame the more auspicious it is. This jyoti / light has to be maintained throughout the puia. 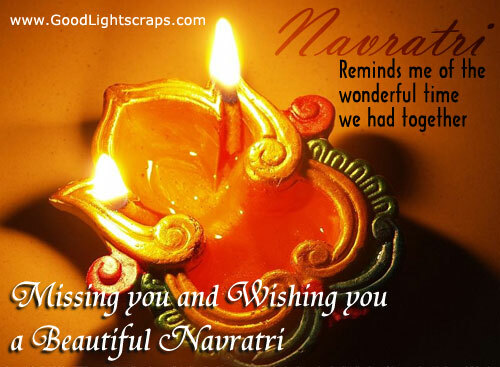 At the conclusion, fold your hands and circle them around the jyoti. Perform Durga Saptashati or Devi Kavach (hymn invoking Devi's protection) either yourself or by a Pundit. Some people go to the temple for these nine days to perform the puja. Many people fast on this Day. At least one meal should be a phalaahaar and the other can be with cereal. 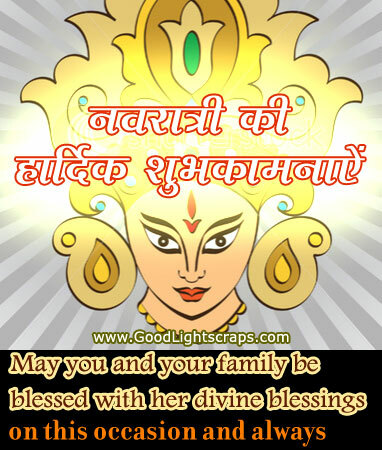 Many people conclude the puja on the 8th day by doing Devi ki Kadhai. 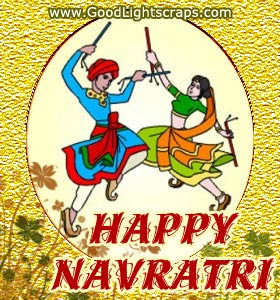 On this day, Maa ki jyoti is taken with halwa. You should make atta halwa, chawal ki kheer, puri, kaala chana (black grain) and one or two vegetables. Unmarried girls are invited for meal. After the food, the girls are given some fruits and money as Dakshina. Some people do Devi ki Kadhai on the 9th day. Tumko Nishidin Dhyavat, Tumko Sabdin Sevat, Hari Brahma Shivji... Jai!! Ujjwal Se Dou Naina, Ujjwal Se Dou Naina, Chandra Vadan Neeko… Jai!! Raktapushpa Galmala, Lalpushpa Galmala, Kantahan Har Saje… Jai!! Sur Nar Munijan Sewat, Sur Nar Munijan Sewat, Tinke Dukkhahari… Jai!! Kotik Chandra Diwakar, Kotik Surya Diwakar, Samrajat Jyoti… Jai!! 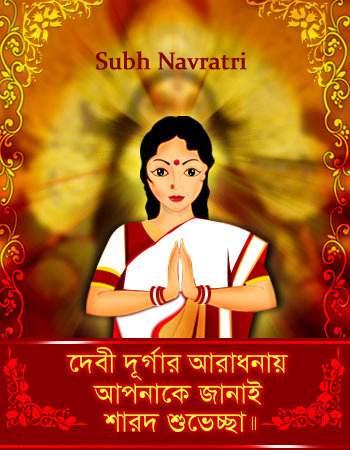 Dhoomra Vilochana Naina, Madhura Vilochana Naina, Nishidin Madmati… Jai!! Aagam Nigam Bhakhani, Aagam Nigam Bhakhani, Tum Shiv Patrani… Jai!! Bajat Tal Mridanga, Bajat Dhol Mridanga, Aur Bajat Dumroo… Jai!! Manwanchhit Phal Pavat, Man Iccha Phal Pavat, Sewat Nar Nari… Jai!! Malketu Mein Rajat, Malketu Men Rajat, Koti Ratan Jyoti… Jai!! Kahat Shivananda Swami, Ratata Shivananda Swami, Sukh Sampati Pave!! 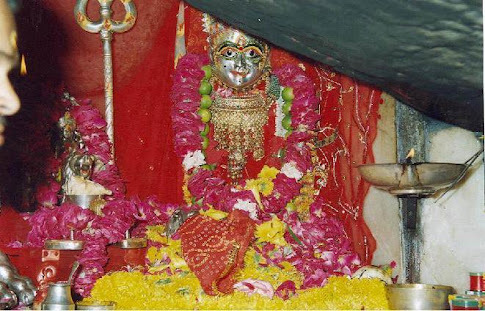 Tumko Nishidin Dhyavat, Tumko Sabdin Sevat, Hari Brahma Shivji! !